G'day, greetings from Down Under! I'm glad to report that YCS's first ever Australian get together was a roaring success . . . though I (Josh) have to admit I'm still full of Aussie beer and in the company of David and Philippa Ward who are staying at our place as I write this. The incredible news is that about 25 York City fans (including a few semi-reluctant WAGS) turned up for our gathering and we dominated the activity at the Woolloomooloo Bay Hotel until we were turfed out close to midnight. To say a good night was had by all is an understatement. 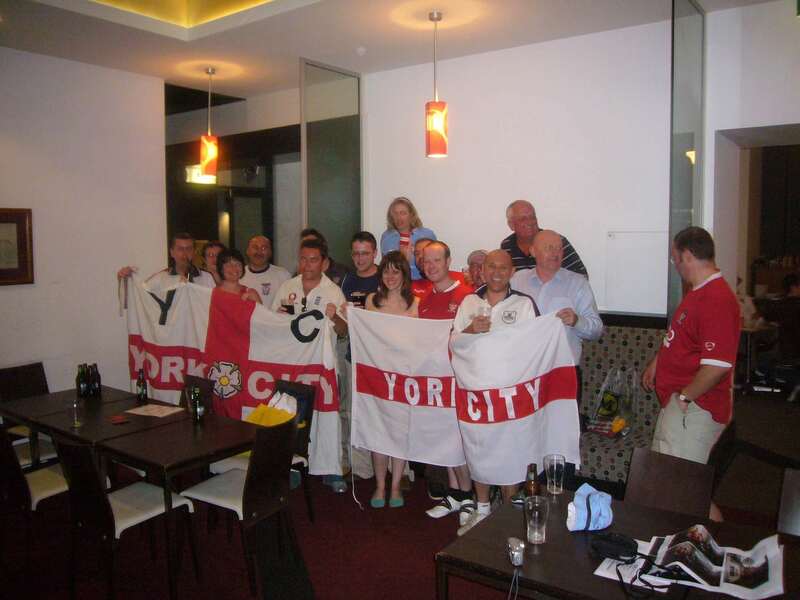 It was really quite comforting - and a bit strange - to see so many familiar faces and different versions of the York City home and away strip all in a place surrounded by sea, sun and disgruntled English cricket fans. I've attached photographic evidence of our gathering - there were about 4 others taking the photographs at the time. Spookiest moment for me was meeting a guy I last saw in school at York when we were 13 - he's lived in Sydney for the past 10 years and has promised faithfully to fork out his sub to join YCS. Even spookier, he could recite the entire register (alphabetically) for our class at school when we were 11. Oddly, not many others seemed keen to join our conversation but there you go . . .
Oh, I've attached two photographs from tonight as I thought you'd appreciate seeing the one where Philippa removed her clothes and streaked behind the YCFC flag. I'm sure she'll pay plenty for the jpg files when she gets back to the UK. Over to you and the YCS web site, Chris . . . Seriously, tonight went very well and it says a lot for our club that so many of us can get together so far away. We haven't seen many MUFC supporters doing the same! Thanks for supporting us in our efforts to get together Down Under (sorry, Dot, but Geoff Boycott didn't turn up) - though we had a cracking evening, we still missed having you guys to share it with. Oh, and sad to say, we created another piece of history for YCS for all the wrong reasons. Tell Woody we held the first ever YCS meeting without real ale in the history of our group.